The country surrounding Darwin has more than its fair share of waterfalls. Our landscape is patterned with rivers and rapids, gorges and escarpment. Our landscape goes through extreme seasonal changes: whilst our waterfalls are perfect for a refreshing dip in the dry season (as long as they are crocodile free, of course), they become a deathly torrent of raging flood waters in the wet season. Our waterfalls are some of our most loved attractions - loved by tourists and locals alike. 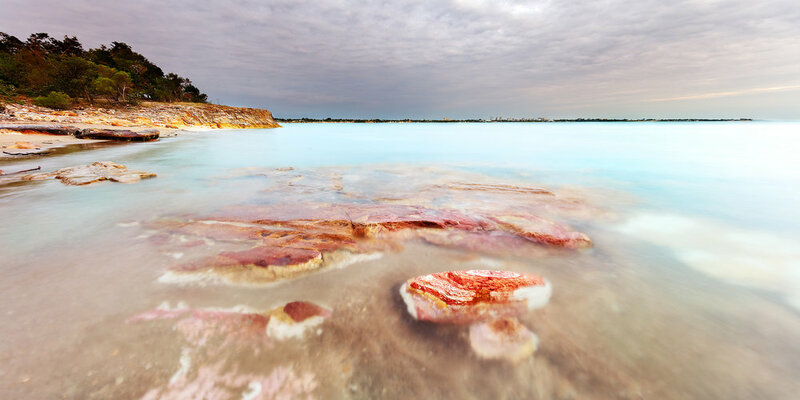 So how do you go about photographing these natural wonders? 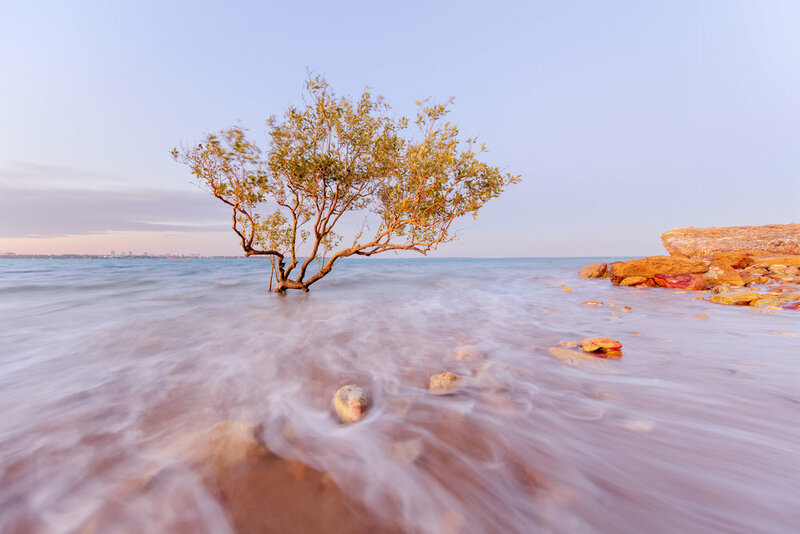 Here are my tips for photographing our Top End Waterfalls - these tips are specific to our Darwin, Northern Territory region, with information on seasons, tips and information with specific examples. I will follow this post with Part 2 - practical advice for how to shoot waterfalls, where ever you are! Darwin's waterfalls are at their most spectacular after the monsoon. 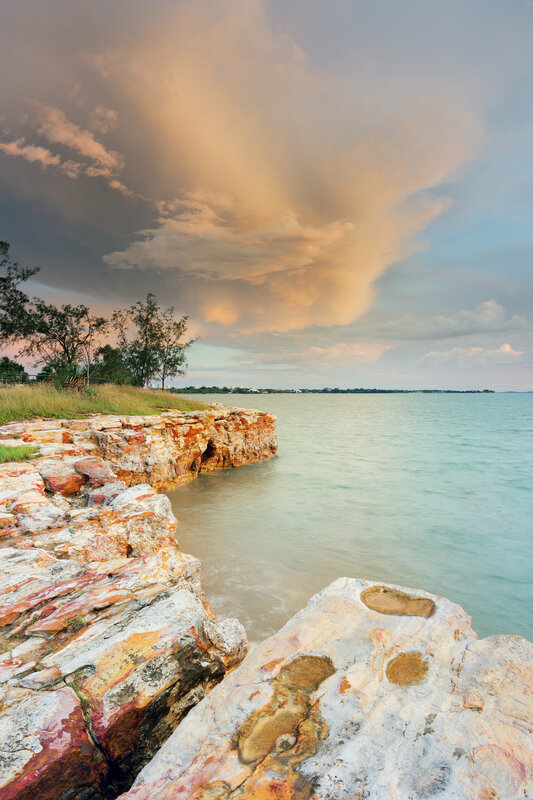 Accessing these spots can be a little trickier due to flooded roads, so sometimes wet season travel can be a bit difficult. Most, if not all, of the regions' gravel roads are closed and even bitumen roads can be closed for short periods or limited to 4WDs only. Our wet season runs from October - May. Roads are generally still accessible until the end of November (rainfall dependent), but after a long dry season the waterfalls are flowing very low. Our biggest rainfall months are typically January and February - this is when road flooding typically occurs. You will need to carefully plan where you visit. This week (19th Feb 2014), Litchfield Park road was flooded at the Finnis River, and impassable at Aida Creek. Although the waterfalls are spectacular at this time, they are difficult to photograph - grey overcast conditions can often dull the photographs, and spray from the falls fogs lenses and filters easily! If you are planning a trip to visit Darwin, I would say the best time for photographing the waterfalls is around April-May. The falls are mostly in fast flow after the season's rains, but flood waters are beginning to drop as the season comes to an end. Roads are slowly beginning to reopen (seasonal conditions effect the road openings, generally around late May - July the 4WD roads begin to open). It's not just the time of year that effects photographing our waterfalls here, time of day also impacts on shooting. 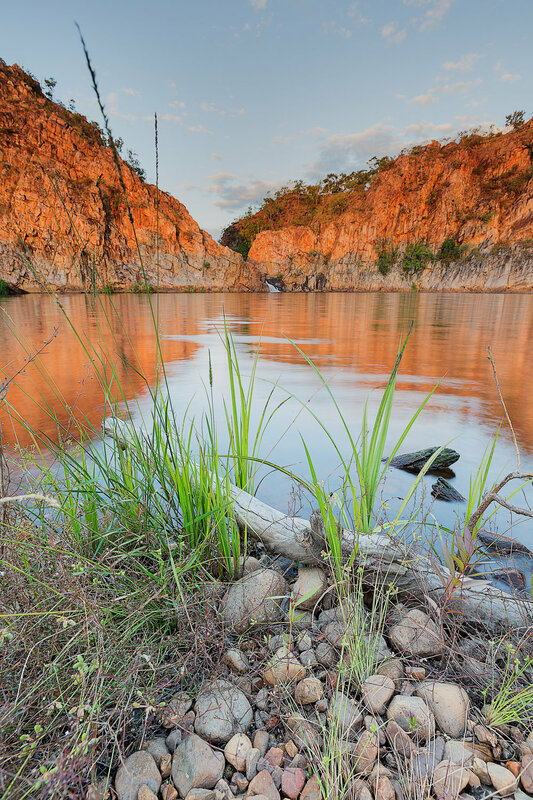 Wangi Falls, Litchfield National Park: SUNSET in the early dry season. This waterfall is very popular with swimmers in the dry season, but it remains closed to swimmers in the wet season and early dry. If you don't want people in your photos, try to shoot this place late April/early May, before the swimmers are allowed in! At sunset on a clear sky, this waterfall and the escarpment glow bright red in the last of the suns' rays. The sun sets behind you (if you were facing the falls), shining light on to the falls. It actually sets behind the trees, but don't give up and leave - if you wait until after the sun has gone, you will be rewarded with the red glow if the conditions are right. This location is very difficult to photograph due to its position. 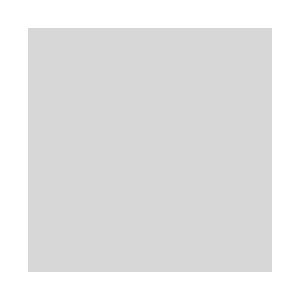 It's mostly shaded, and the bright sky above can cause some exposure issues. Sunrise and sunset are both challenging here, there is no real "best time" of day for photography Florence Falls. I only recommend sunrise because this waterfall gets VERY busy.... Most people are still in bed at sunrise so shooting here means you usually have the place to yourself. That's very rare! Get here at lunchtime on a weekend and I guarantee you will have to fight for a swim! (Ok, not quite, but you get the point). I recommend going down to the bottom of the falls. The view point at the top is a little obscured by trees, it's a better vantage point from the bottom... provided you don't mind wet feet. Descending down to the plunge pool of Florence Falls is down around 200 steps, and to get a decent vantage point of the falls you will need to take the camera gear across a creek. A cliff face conceals your view of the falls upon arrival at the bottom. If you cross the creek there are plenty of interesting compositions within the rocks and trees, with the falls as a backdrop. Tolmer Falls is viewed only from a viewing platform, a short walk from the car park. Late afternoon to sunset is the ideal photographing time for this waterfalls, with the sun shining on to the escarpment face. Jim Jim Falls, Kakadu National Park: Sunset, as soon as the road reopens after the wet! Jim Jim Falls is probably the most iconic waterfall in the Top End. 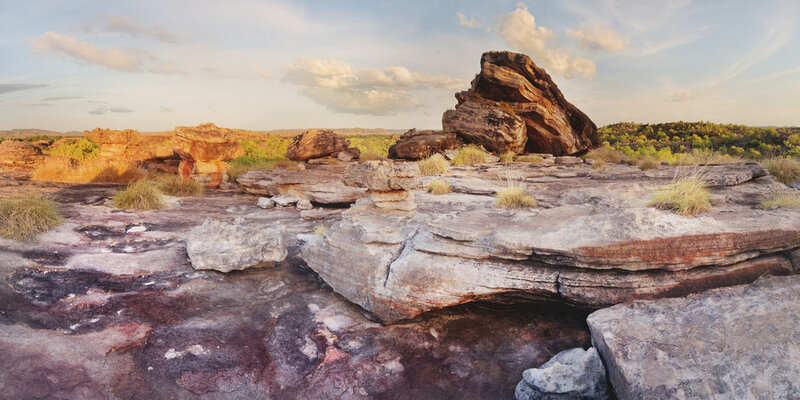 It's the tallest in Kakadu at 200m (660 feet), it's escarpment is bright red and it's creek a clear blue. This waterfall is spectacular in the wet season as the run off from the rain races for the plateau's edge. At this time of year the falls are only accessible by air. When the road reopens, it is a gravel track for around two hours' drive with the last 12km as four-wheel-drive only. This waterfall is only rain water fed, not spring-fed like Litchfield's falls. This means it doesn't flow year round. It also means there is quite a small window of opportunity to shoot this place with water flowing. The road re-opening depends on the amount of rain, but if you want to see this place with water flowing you need to visit very quickly after the place becomes accessible again. Once there, if you want to make your way all the way to the plunge pool for a dip, feel free (beware, it's COLD as it is always in the shade). However, it is quite a long, tricky walk over boulders and rocks. I find the best photographic vantage point is right at the start of the walk. There is a viewing area on the right hand side of the trail, around 10 minutes in to the trail. This is an awesome spot for sunset, as the light illuminates the top of the escarpment. A very similar shot to another I took of Jim Jim Falls this visit. This one differs in it's wideness - this is four vertical shots stitched together to make the view of the gorge a bit wider. This is probably one of my favourite waterfalls to enjoy for swimming and relaxing. The walk up to the top pools is a little steep and challenging but the views over the country are incredible. The top pools are best photographed at sunset - but beware, as that means you have to walk back down in the dark. Head torches and proper shoes are essential! The bottom pools are a little like Jim Jim Falls in that they dry up after the wet season rains cease. The escarpment at the bottom pools is very interesting in colour, and if you're brave enough you can take your camera in there to get closer to some interesting rocks and trees in the water. The bottom falls are also best photographed at sunset. Access to this waterfall is also seasonal. Gunlom is accessed by a gravel road which is a little bumpy but just about suitable for two-wheel-drive vehicles. It will be a little slow going for the last section of the track though. There is camping and flushing toilets too! Edith Falls is around 50km north of Katherine, and is very easy to find as it is straight off the main Stuart Highway. 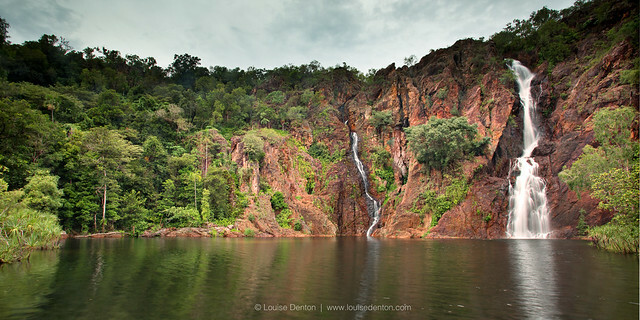 There are two main areas at Edith Falls: the bottom pool is a large pool, gorgeous red cliffs and a small waterfall. Or, you can venture up to the top pools which is around a 45 minute walk. You can also swim at the top pools and there is a larger waterfall there. Both places are best to photograph in the late afternoon and at sunset. I've devised myself a little itinerary for this location which seems to work well! Head up to the top pools first, the sun dips below a hill from this vantage point, around forty minutes before sunset. 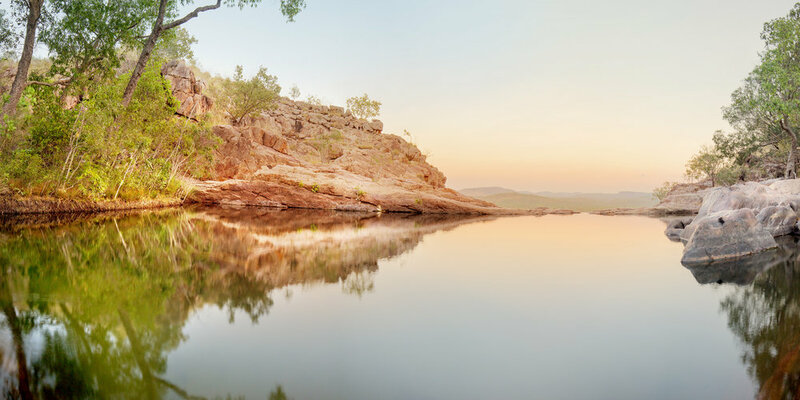 This gives time to have a swim and take photographs of the top pools and still have time to get down to the bottom pool for sunset. This waterfall is quite tall and the walk to it is also quite photogenic as you follow the creek. The light is best here at sunrise. I'd recommend walking straight to the main falls and then working your way back. Sunrise shooting is not an option here as the pools do not open until 8am, and close well before sunset. This is a great place to relax for a day, but if you have photography in mind make sure you arrive early to avoid the crowds. 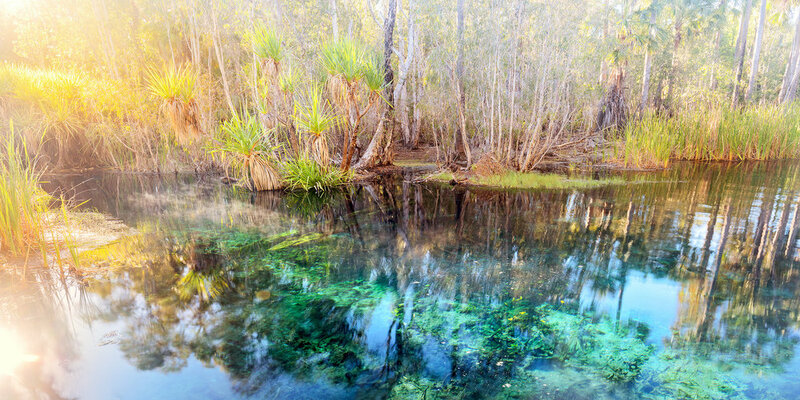 Kangaroo Falls is a very small waterfall at Berry Springs, but the series of pools can keep you exploring for hours. 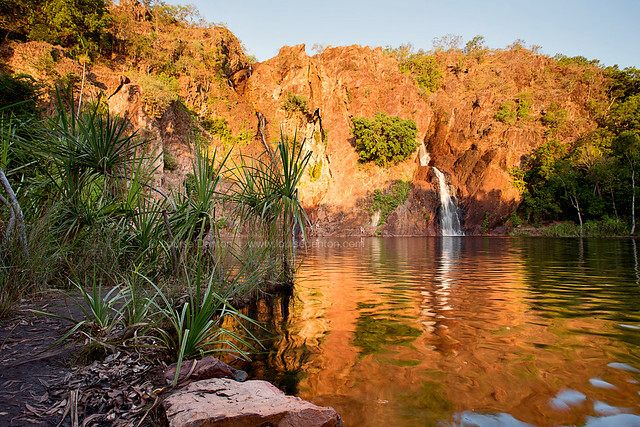 Can you think of any other waterfalls near Darwin that are worth covering for potential visitors? 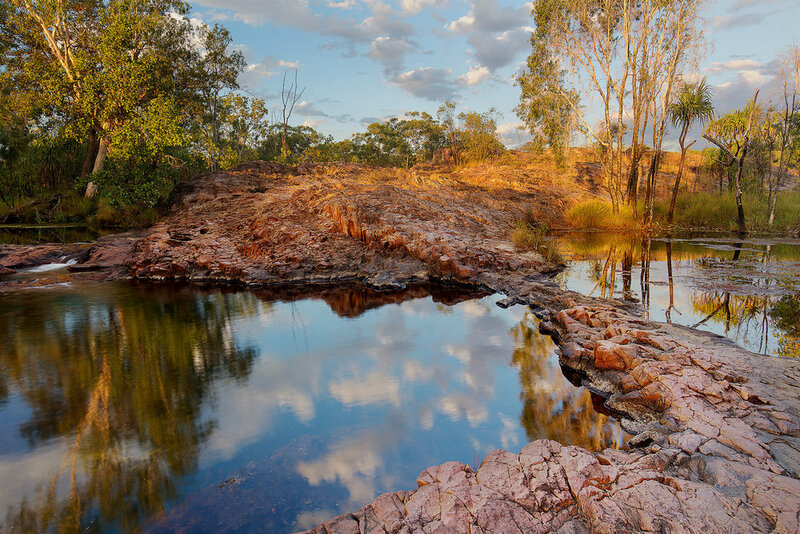 These are my favourites, but there are dozens more beautiful waterholes around our region. My next blog will include all of those tips on how to take the best photos when you get to these locations!